Early detection of life threatening heart disorders, stroke and other diseases is possible through the use of vascular testing procedures performed within hospitals, outpatient centers, and physicians' offices. Cardiovascular diseases are the No. 1 cause of death in the United States. On average, one American dies every 39 seconds of cardiovascular disease - disorders of the heart and blood vessels. Stroke, a disorder of the blood supply to the brain, is the third leading cause of death and the leading cause of disability in the country, with nearly 800,000 new strokes occurring annually. There are many factors that contribute to an accurate diagnosis based on vascular testing. The training and experience of the technologist performing the procedure, the type of equipment used and all the quality assessment metrics each facility is required to measure, all contribute to a positive patient outcome. IAC accreditation is a "seal of approval" that patients can rely on as an indicator of consistent quality care and a dedication to continuous improvement. 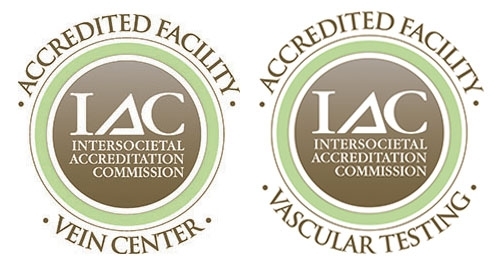 The Vein and Laser Center of New Jersey located in Hamburg , NJ has been granted an additional three-year term of accreditation by the Intersocietal Accreditation Commission (IAC) in Vascular Testing in the area(s) of Peripheral Venous Testing. This latest accreditation awarded to the Vein and Laser Center of New Jersey demonstrates the facility's ongoing commitment to providing quality patient care in vascular testing. Accreditation by IAC indicates that The Vein and Laser Center of New Jersey has undergone an intensive application and review process and is found to be in compliance with the published Standards. Comprised of a detailed self-evaluation followed by a thorough review by a panel of medical experts, the IAC accreditation process enables both the critical operational and technical components of the applicant facility to be assessed, including representative case studies and their corresponding final reports. The Vein and Laser Center of New Jersey is also IAC accredited as a Vein Center.